The United States first flew into a panic about Ebola when the crisis first reached the country in September 2014. For most Americans, the hype has died down, but for some, Ebola remains a source of real stress, not just hypochondriacal fantasy. 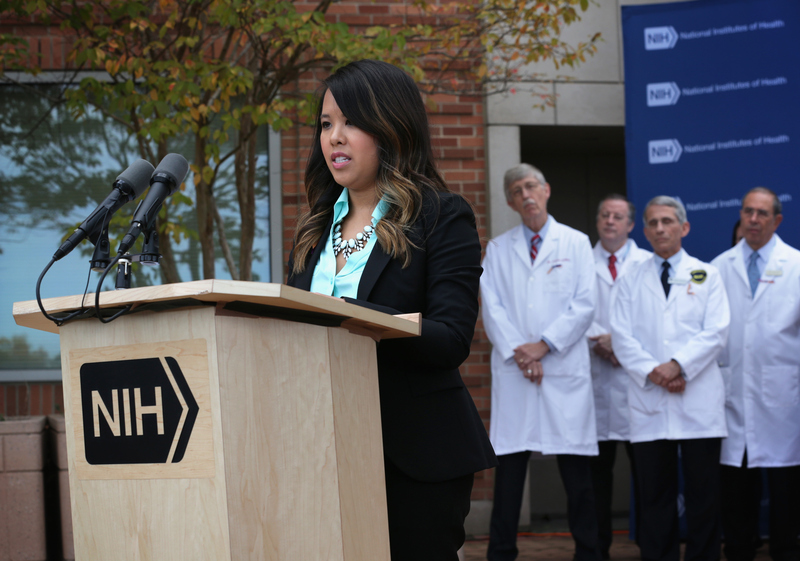 Nina Pham, 26, perhaps better known as the "Ebola nurse," treated Ebola patient Thomas Eric Duncan at Texas Presbyterian Hospital in Dallas until he died on Oct. 8. Pham contracted the disease from Duncan, and she was diagnosed three days later. After being declared Ebola-free, she says she is still haunted by her encounter with the disease, so much so that Pham is suing the Texas hospital for personal damages. Pham was treated at the National Institutes of Health Clinic in Bethesda, Maryland, for several weeks. She finally tested negative for Ebola in late October. At a press conference after her release, Pham thanked her medical team for her care. As a nurse, I have a special appreciation for the care I've received from so many people — not just doctors and nurses, but the entire support team. But on Monday, Pham filed a lawsuit against the hospital, suing for an unspecified amount of damages for personal and professional ramifications resulting from her clash with Ebola. According to Pham, she was not appropriately trained or equipped to treat a patient with Ebola, and her negative experience treating and contracting the disease left her with physical problems including nightmares, body aches, and hair loss. Not to mention, her career and personal life have been affected because people recognize her as the "Ebola nurse." Even though Mr. Duncan had been at Presbyterian for a day and a half with a differential diagnosis of Ebola, when it came time to admit him to the ICU and have Nina take care of him, the sum total of the information Nina was provided to protect herself before taking on her patient was what her manager "Googled" and printed out from the Internet. The fact is, I'm facing a number of issues with regard to my health and my career and the lawsuit provides a way to address them. But more importantly, it will help uncover the truth of what happened, and educate all health care providers and administrators about ways to be better prepared for the next public health emergency. Pham's lawyer, Charla Aldous, said Pham hopes to be "a voice for other nurses" with her lawsuit. "This is not something that Nina chose," Aldous said. "She's hoping that through this lawsuit she can make a change for the better for all nurses."